Stephanie grew up in Redmond, Washington just outside of the rainy city of Seattle. Growing up she successfully competed in the Hunter/Jumper and Eventing Circuit around the Northwest. She then moved to Colorado to attend Bel-Rea Institute to become a Certified Veterinary Technician. 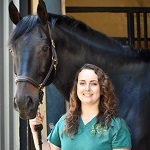 While in Colorado she did an internship at the prestigious Littleton Equine Medical Center with her ultimate goal of becoming an equine technician. After graduation she moved to Oklahoma to be with her fiancé and then soon after got married to Kit Bingham. Kit and Stephanie have two beautiful little girls, Brynlee and Izzie. Stephanie has happily been a team member of Exclusively Equine since 2011. We are very excited about Stephanie completing her Equine Sports Massage Therapy certification course and is certified in equine sports massage therapy ESMT. In her spare time Stephanie enjoys riding, going on adventures with Brynlee, and having BBQ’s with friends and family. Mackenzie was born and raised in Kansas City, Missouri where she participated in 4-H and trail riding with her dad. She has always had a passion for animals from a young age, and was always bringing home different strays. In 2012, she moved to Stillwater to attend OSU and graduated in 2015 with a BS in Animal Science Production with an emphasis in equine. After graduation she moved to Tulsa to enhance her medical skills in a very busy small animal practice. Although she enjoyed her time in the small animal field, she was ready to move back into equine medicine. In her spare time she enjoys reading, volunteering at animal shelters, caring for foster animals and rehabbing injured wildlife. Mackenzie joined the EEVS team in August of 2016. She is excited for a new start in OKC and is looking forward to continuing her equine education.